I had been pretty disappointed in my earlier attempts at homemade probiotic root beer. 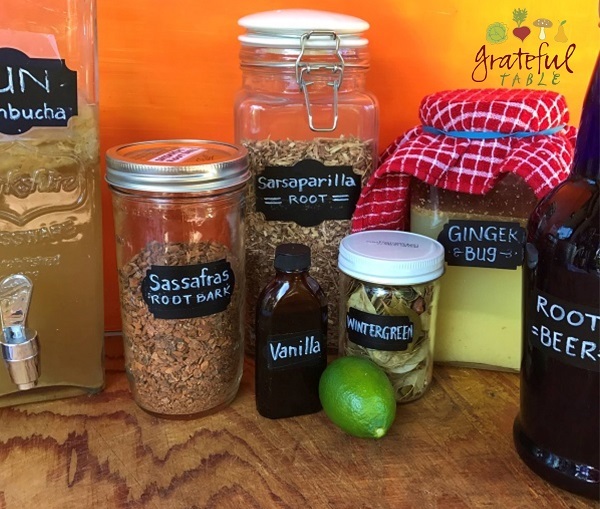 I bought all these individual ingredients to make it from scratch, only to realize it would’ve been much easier to just buy natural root beer extract (or even a root beer blend). But then I started adding “Ginger Bug” to the second ferment of this “root beer”. I discovered this made a pretty authentic, healthy substitute for the typical root beer soda. And now that I have the root beer ingredients on hand, I can make many batches of this extract, for considerably less cost than buying the store-bought extract. And–the blend can be customized to individual tastes. I finally have a great root beer soda recipe, even though it took awhile. First off, some folks said, “boil the bark for for a long time”, or “pour more boiling water on the strained bark, to extract more flavor and make a second batch. Nope–that did not work out well. I discovered that the best flavor comes from simmering the first four ingredients for twenty minutes only. I suspect that other less-desirable elements start coming out when it’s simmered for longer. Personal opinion- just sayin’. This recipe makes 2-3 cups, enough for two or three batches of 32-oz. brew. The extra can be stored in refrigerator for several months. Bring mixture back to a boil, then lower heat and simmer for 20 minutes. Strain into a bowl or other container. To the pan of sugars, slowly add back some of the strained liquid. Stir until smooth, reheating to dissolve sugar, if necessary. Shake or stir well until dissolved. This “Root Beer Extract” will make two or three 32-oz. bottles of finished root beer “soda”. Leave the second-ferment bottle out for a day or two, until well-carbonated, then refrigerate. Refrigerated, it keeps up to a month.